A municipal electric utility could provide electricity to the city of Decorah for about $5 million less a year than current provider Alliant Energy, according to a recently completed feasibility study requested by the citizens’ group Decorah Power. 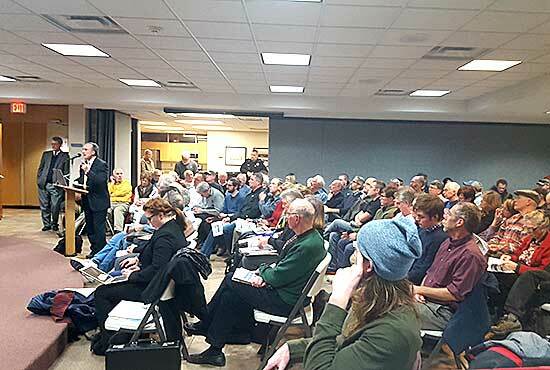 The results of the study, compiled by NewGen Strategies and Solutions of Denver, Colo., Dave Berg Consulting of Rosemount, Minn. and Exponential Engineering of Fort Collins, Colo., were reported during Tuesday night’s Decorah City Council meeting. “Alliant has the highest rates in the state,” Berg told the Council. Even if the feasibility study’s rate analysis “was way too optimistic,” overstating Alliant’s future rates while underestimating the rates a MEU would charge, there would still be a significant difference between the rates the two entities would charge, he said. The Decorah City Council has taken steps that have allowed Decorah Power to explore a municipal electric utility (MEU) for the city. Last March, the Council approved a moratorium on renegotiating a franchise agreement renewal with Alliant Energy. The current agreement with Alliant expires in May. The Council also approved having Decorah Power pursue a feasibility study of establishing a MEU; no city funds have been used toward the study. “The rate differential is robust and rates would be stable for quite some time,” Andy Johnson of Decorah, treasurer of Decorah Power, said. Having a local utility would have a “tremendous impact” on the local economy, he added. The purpose of the study was to answer the question of whether a MEU could operate at a lower overall rate as compared to Alliant. “The answer is a resounding yes,” Johnson said. The NewGen report projected a MEU would charge an average community wide rate of about 9 cents per kilowatt hour, compared to the 13 cents per hour charged by Alliant. Over a 10-year period, annual savings would range from $5.3 million in the first year to $5.9 million in the tenth year. Iowa Code gives municipalities the right to apply to the Iowa Utilities Board (IUB) for the creation of a MEU. The IUB must grant the request if it deems the proposal to be in the public interest. The first step toward exploring a MEU was completion of a feasibility study. Decorah Power and/or the Council will now decide whether or not to bring the idea of forming a MEU to a citywide vote. The Council could call for a vote, or citizens could petition to have the issue placed on a ballot. If the public votes to approve it, the city would file a MEU application with the IUB. If the IUB gives its approval, the city would buy out Alliant’s electrical infrastructure and service the customer base. Iowa has 136 municipally owned electric utilities, 44 rural electric cooperatives and two investor-owned utilities. “We’re not reinventing the wheel. There are 2,000 MEUs nationwide, it’s something communities are pretty good at,” Johnson said. The Upper Midwest is a “hotbed” for MEUs, Berg said. Many of them are more than 100 years old and were established in places in the “middle of nowhere” – where the citizens had to form their own utility themselves if they wanted electricity. A local utility board, appointed by the mayor and approved by the Council, would oversee the MEU. By having local control, Johnson said the utility board could set priorities for the community and make decisions on how the savings of having a MEU would be best utilized – whether it be lower rates, investing in clean energy, improving reliability by burying power lines and other practices or paying down debt faster. The feasibility study estimated the cost of purchasing Alliant’s physical assets at $5,087,775, which factors in depreciation. Startup costs for a new utility, including attorney, consulting and regulatory fees, labor, software and equipment, total about $2 million. Financing acquisition through a 5 percent taxable bond issue over 20 years would result in a $446,000 annual debt payment and financing startup costs through a 3.5 percent tax-exempt 20-year bond issue would require an annual $160,000 annual debt payment. Decorah Power has hired attorneys Andy Nelson of Decorah and Sheila Tipton of Des Moines to assist in the organization’s efforts. Tipton told the Council she has spent her 38-year law career in the public utility arena and is a former member of the IUB. She said she became involved with Decorah citizens who wanted to build a community solar field in Decorah a few years ago, which was not allowed to happen. The citizens formed Decorah Power, which began looking into municipalization, about 16 months ago. Tipton said Alliant has requested the city delay a referendum on a MEU until Alliant works with the city and Decorah Power to determine if data is missing from the Decorah Power analysis that could be used to improve the accuracy of its feasibility study. But Tipton said because of Alliant’s failure to provide information the Council previously requested due to confidentiality and security issues, she sees no reason to comply with a delay. “I urge the Council not to take that approach, unless (Alliant) is forthcoming with their own information and I don’t think that’s going to happen. I see no reason to engage in that effort. That would result in more expenses to Decorah Power and more delay. My own view is you should just get on with it. I encourage the Council to call for the referendum and start the process,” Tipton said. Tipton was asked about how Alliant’s assets would be determined and she responded the IUB determines their value and whether it’s in the public interest to acquire those assets. The attorney said Decorah is not in the same situation as other communities that in recent years were unsuccessful in their attempts to establish a MEU. “Not only is this (Decorah Power) feasibility study very well done, it’s only going to get better. Decorah is a very progressive city in terms of its views about renewable energy and energy efficiency and operating those systems for public good,” she said. Mayor Lorraine Borowski said the city has a lot of information from Decorah Power, as well as Alliant Energy, to digest. Council member Randy Schissel suggested after reviewing the information, representatives of Decorah Power and Alliant be brought back to answer questions from the Council. Borowski allowed two comments from the public at the conclusion of the meeting. Herb Hageman of Decorah, a former Alliant employee, asked whether a MEU would be insured for catastrophic losses, and Berg said all of his clients are. Hageman also asked if more citizens install their own solar panels whether the MEU could handle the loss of revenue from those customers. Berg responded he doesn’t envision 1,000-roof-top solar installations in Decorah, but if there were a drop in revenue due to customers producing their own energy, there also would be a reduction to the MEU’s cost for purchasing wholesale power. Tuesday night’s report is the culmination of efforts that have been going on by local volunteers for nearly a year and a half, Decorah Power Board President Larry Grimstad told Decorah Newspapers. Johnson said the people involved believe the potential benefits of a MEU are large and significant enough that it’s worth making the effort to pursue the idea. “The reason we got started with this in the first place was looking at what a new business in town, with revenue of $10 million to $15 million a year, could offer Decorah … simply running a business with that kind of revenue there should be some opportunity for local engagement,” said Decorah Power Secretary Joel Zook. “Decorah Power believes that while not without risk, the opportunities facing Decorah through creation of a 21st century MEU will pay community dividends for generations, and simultaneously promote a healthier world for those future generations. We have done our best to do our homework and hope the NewGen feasibility study and this companion report provide sound footing for the community and City Council to proceed,” a statement from the Decorah Power Board said. The NewGen feasibility study results and a companion piece developed by Decorah Power which includes contributions from “experts” who presented on the topic of MEUs as part of a learning series organized by Decorah Power last year are posted on Decorah Power’s website, decorahpower.org. I feel areas outside city limits should be able to vote on this.We would be mandated to join Decorah Power with no say in the matter. This comment has been hidden due to low approval.